PRIYAMINA AUDIO VISULAS offers the largest selection of touch screen technologies CRT touch screen monitor and LCD touch screen monitors and carefully designs Each product for the demanding requirements of diverse applications, such as industrial, medical, POS, retail, hospitality, transportation and gaming. 5 WIRE TFT TOUCH SCREEN MONITOR. 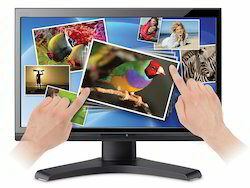 Looking for TOUCH SCREEN MONITOR ?